I fly fished for the first time in Southwest Virginia. I was guided by a local fisherwoman to a special spot that just a few fly fishers in the area have access to. When we pulled up to the remote spot just outside of Marion, Virginia, we opened the horse gate and were immediately greeted by a couple of chipper farm pups. They happily trotted alongside us as we made our way down to the creek a few paces from the entrance. Once you wade out far enough into the flowing stream, it’s hard to hear anything besides the sound of the water babbling across rocks around you and the chirp of birds in the trees. All I caught that day were a couple of rocks and a tree branch, but it’s one of the most meditative sporting experiences I’ve had. Fly fishing is like the sophisticated cousin of the spin fishing (the kind that has a mechanical spinner and endless streams of translucent line). When fly fishing, there’s work to be done and it’s constant—no dropping a line and taking a nap. But the motions are so finessed and repetitive that you get lost in the moment with just you, the water, the line, and the great outdoors. There’s nothing else like fly fishing and nowhere else like Southwest Virginia. Here’s your guide to combining the two. Before you hit the water you’ll need to know whether or not you need a license to fish in Virginia. If you’re not a resident, chances are you do. You can figure it out on the Virginia Department of Game and Inland Fisheries’ website and they’re easy to buy online. The limit is six trout per day per person and they all have to be bigger than seven inches in length. 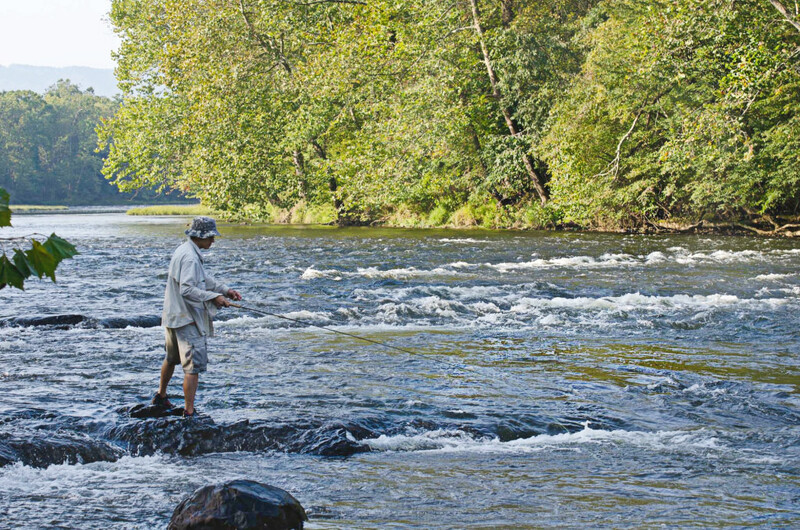 The trout season is always open in Virginia, but there can be exceptions that are listed here. Even though you can drop a line any time, you’ll have the most success with trout in the spring, fall, and mild winter months. The summertime usually means more difficult fishing thanks to warm water temps and low stream flows but, hey, if you want a challenge go for it. Whether you don’t want to haul your own gear around, end up needing extra line or other supplies, or simply want a bit of inside information to improve your experience, there are a host of local guide services and shops to choose from. Richie Hughes runs New River Trips LLC. He used to teach chemistry and physics to high schoolers in his previous life, so he’s got instruction in his bones. Kids can fish for a discounted price. Tri-State Angler Guide Service is based in North Carolina but they guide through Virginia as well, specializing in trips to Whitetop Laurel Creek. A master at tying flies, Mike Smith of New River Fly Fishing has been doing this for over 20 years. They’ve got lodging options to boot. Grassy Creek Outfitters are masters of the Upper New River and are expanding to offer a variety of paddling and other aquatic adventures on the Little River. The Virginia Creeper Fly Shop in Abington is a one-stop shop for everything fly fishing. They’ve got guides, information, and supplies coming out of their ears. You can tell they do it because they love it. The only problem you’ll run into when fishing Southwestern Virginia is deciding where to go. The silver lining is that you really can’t go wrong because each spot is not only nestled in picturesque natural surroundings but serves up a variety of fish like bass, walleye, sunfish, and plenty of different trout. Here’s a general overview, but have a read through this handy guide or peruse the Blue Ridge Highlands Fishing Trail website for all the details on the type of fish you can snag in each spot as well as exact locations. You can also use this online fish finder if you want to decide where to go that way. The best places to stay when fly fishing in Southwest Virginia are Abingdon, Glade Spring, Marion, and Wytheville. They’re all located along Interstate 81 so getting to fishing spots is easy. Because Southwest Virginia enjoys a variety of visitors every year from AT hikers to retirees, there are places to stay across the region that allow you to save on accommodations or splurge on something fancy depending on your style. For those looking to treat themselves, go for the Martha Washington Inn and Spa in Abingdon. 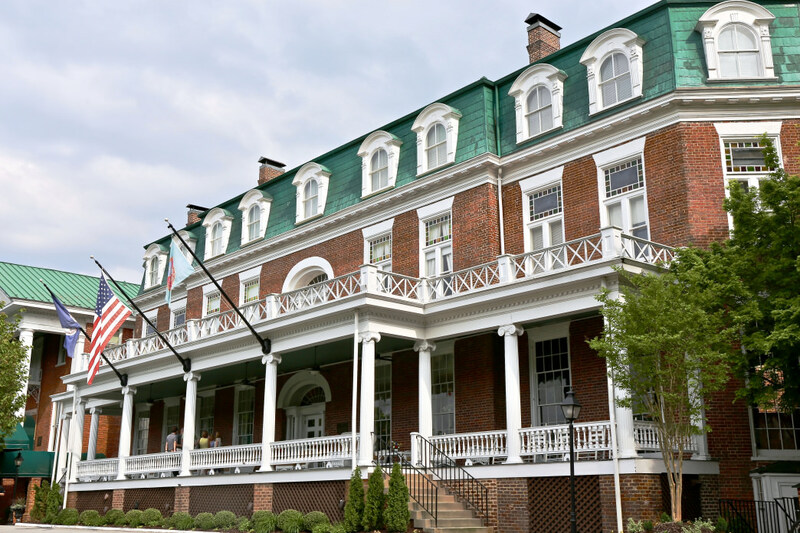 In Marion there’s the Collins House Inn and the General Francis Marion Hotel and Wytheville offers the Bolling Wilson Hotel. 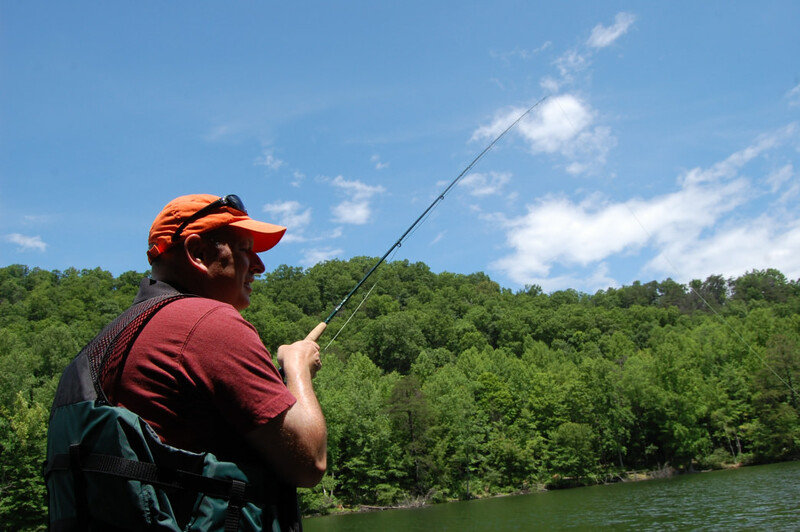 If you’re looking to spend money on fishing rather than a room, there’s a well-rated Econo Lodge in Glade Spring and and Best Western and a Ramada in Wytheville. Abingdon offers a Comfort Inn, Comfort Suites, and a smattering of other budget-friendly choices. And, of course, camping opportunities are plentiful in the area as well. 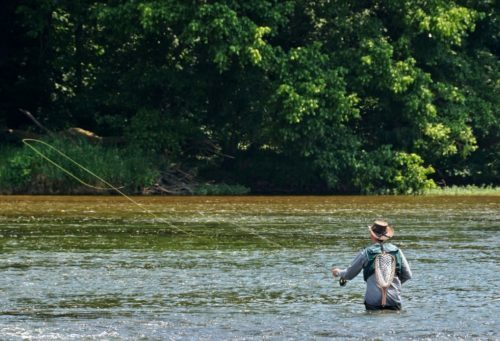 If you’ve never tried fly fishing, Southwest Virginia is the place to learn—and fall in love with—the sport.